Create special displays quickly and easily with our portable étagères. The bold, contemporary design assembles in seconds - no tools required! 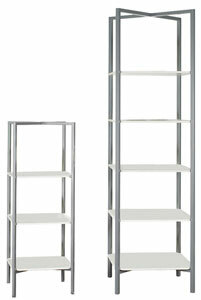 Just rotate the legs to open the silver powder-coated metal frame and insert the white MDF shelves. Folds flat for convenient storage. 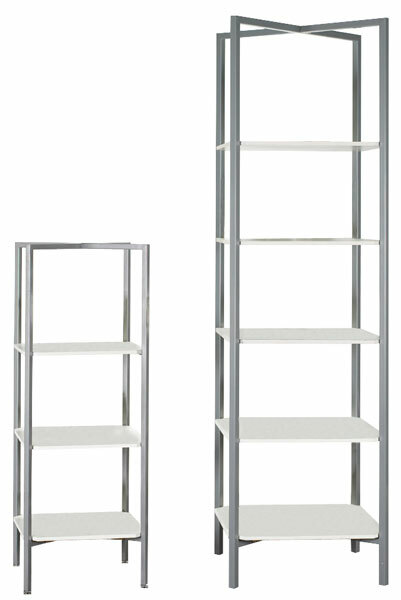 3 Shelf — This unit features 16" square shelves that are spaced 11½" apart. The overall dimensions are 16"W × 49"H × 16"D.
5 Shelf — This unit features 21" square shelves with 12½" spacing. The overall dimensions are 21"W × 76"H × 21"D.